Empowering developers to solve security problems. Developers throw code over the wall and expect it to deploy perfectly. No one knows if the production application is under attack until it’s too late. Applications are elastic... But application security is not. Amid all this, the Security team wants to stop deployment – delaying release cycles. Eventually, the Security team loses credibility and gets left out of the process. Simply put DevOps cannot be successful without bringing the Security team along. Teams embracing DevOps understand that a transition to DevOps cannot be successful without bringing the Security team along. At the same time, practices like “stop and scan” won’t hold up in an environment built on continuous and automated processes. Contrast does not scan. Instead, the application is instrumented with smart sensors to analyze code, continuously, in real time, from within the application. Contrast for its protection suite." Contrast works with the tools you already love. Contrast helps you scale and accelerate your initiatives by integrating & automating security into your Software Development Life Cycle (SDLC). Contrast integrates with Continuous Integration (CI) and Continuous (CD) frameworks. Make vulnerability assessment and its results part of the DevOps tool chain. Contrast integrates with chat operations and IDE tools. Developers can view newly detected vulnerabilities and attack alerts that they can remediate within their environment. Contrast integrates with bug tracking tools to automatically generate tickets, synchronize comments and push security notifications for applications. 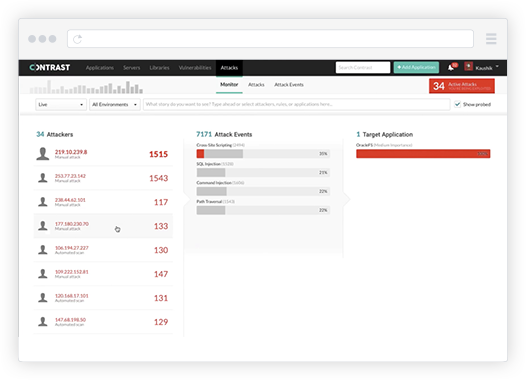 Contrast sends vulnerability data and reports into scanning, testing and project tracking tools within Agile environments. Contrast integrates into SIEMs and other management tools. Security operations teams get highly accurate attack forensics and notifications. Contrast allows you to scale your application security in the environment of your choice without additional configuration or tuning. Tim Chase, Director of Security, recently shared his story of how he successfully built and scaled the DevOps function at Nielsen. Tim says that instrumentation, which enabled applications to be assessed and protected simultaneously and continuously, has transformed his DevOps program. And, by deploying integrations that provide instant notifications, team members can now engage with others, no matter where they are at in the software development lifecycle (SDLC).